DETROIT -- General Motors Corp. wants to develop an internal replacement for CEO Ed Whitacre, probably in a couple of years, two sources close to the situation say. Last week, Whitacre, 68, said the GM board had removed "interim" from his title. A search for a new CEO from outside the company failed to find a top-notch candidate willing to take the job, the sources say. Any top-level executive has a shot at the job, including those running GM's overseas operations, the sources say. Although Whitacre has said GM's corporate culture is fine, his stance on his successor indicates that he's looking for improvement. Whitacre and the board want the winning candidate to emerge from a new corporate culture based on decision-making and accountability, the sources say. Executives say that atmosphere has been missing at the automaker. "It used to be we had such big meetings and everything that you wouldn't make decisions," Vice Chairman Tom Stephens said during a December interview. Now, he said, "We make more decisions walking to the meetings than we used to make at the meetings." The sources say the internal CEO field is wide open. But if a winner fails to emerge, the board will commission a new search for an outside candidate, the sources say. The search that the board conducted after it ousted CEO Fritz Henderson on Dec. 1 found no good candidates who were willing to work under the pay restrictions imposed by the U.S. government after GM's bailout, the sources say. GM's Detroit location and its corporate-disaster stigma also worked against the company, the sources say. 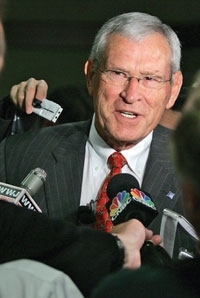 Whitacre, the former CEO of AT&T, also is chairman of GM. He was appointed by the Obama auto task force during GM's Chapter 11 reorganization last year. "This place needs some stability," Whitacre said last week in announcing his official job. "I guess that's me."